AFP Dream Catcher Yingura Toy Tunnel is a beautiful toy tunnel for your cat. The inside of the tunnel is made of a crunchy material that makes a noise when your cat brushes against it. At the end of the tunnel is a pretty dream catcher with beads and feathers. AFP Dream Catcher Yingura Toy Tunnel is a beautiful toy tunnel for your cat. 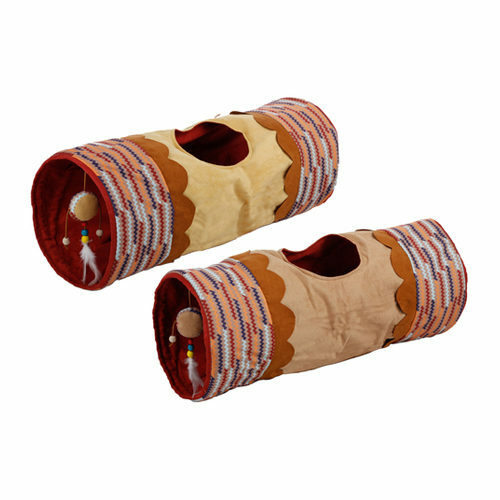 This cat tunnel in Wild West style has 3 different entrances, so your cat can enter the tunnel from different points. The inside of the tunnel is made from a crunchy material, which is extra interesting for your cat. At the end of the tunnel there is a nice toy ball with strings and feathers for your cat to play with. Sand-coloured or beige. This product is delivered at random, you cannot select your colour. Have you used AFP Dream Catcher Yingura Toy Tunnel before? Let us know what you think about this product.